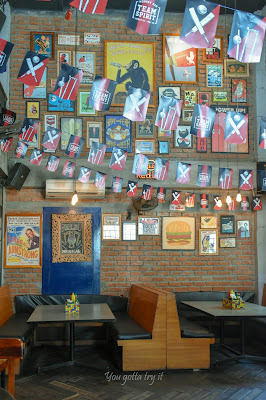 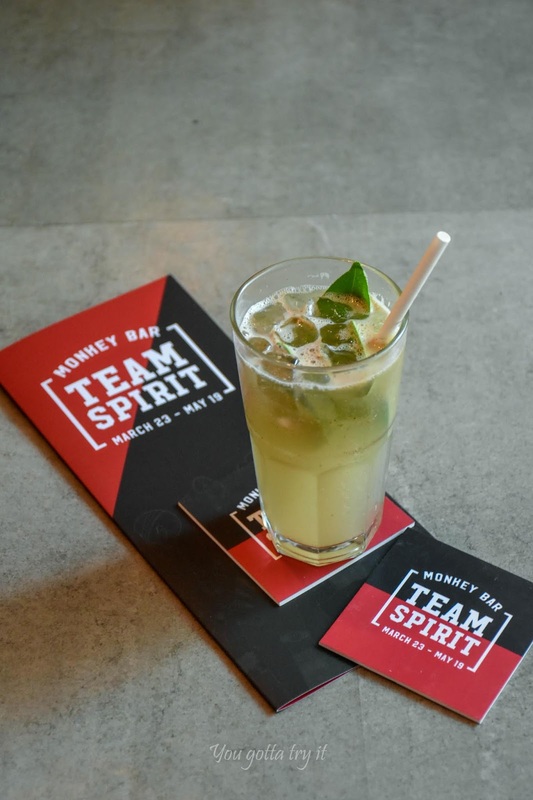 You gotta try it: Cheer for your favorite IPL team with Monkey Bar's exclusive 'Team Spirit' menu! Cheer for your favorite IPL team with Monkey Bar's exclusive 'Team Spirit' menu! 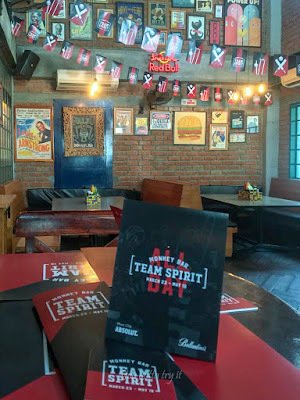 The 12th season of IPL (Indian Premier League) started last month and sorry to mention - RCB still continues to be a hopeless team for namma ooru people. 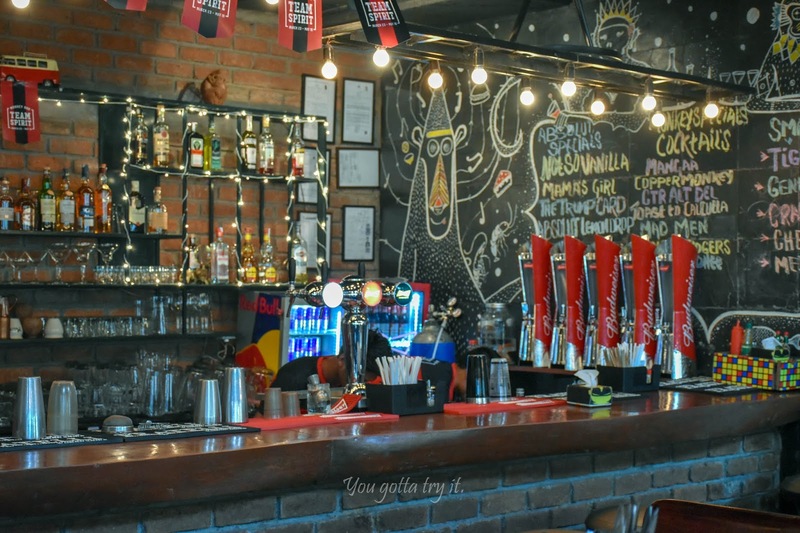 Watching IPL match on a big screen along with friends is always fun and if we have great drinks and grub to enjoy with, then nothing like that. 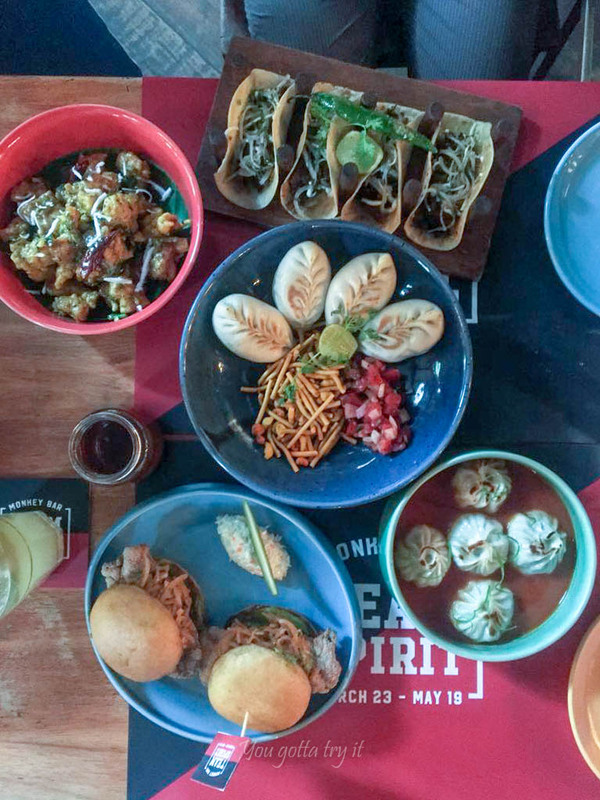 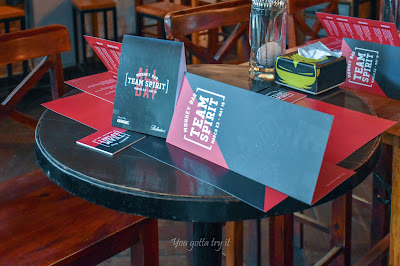 While some of my friends are celebrating the comeback of Chennai Super Kings and Rajasthan Royals, I am feeling all excited about Monkey Bar’s unbeatable IPL menu – ‘Team Spirit’ which is available from March 23rd to May 19th, 2019. Recently I was invited for a special preview of this menu and I must say, I was clean bowled over the dishes created exclusively for this T20 season. 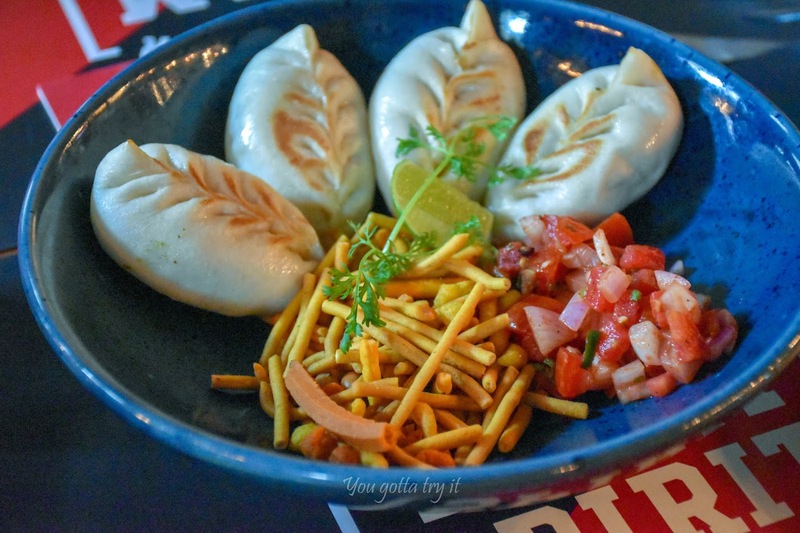 Mumbai Special ‘Gully Bao’ (a dish that is as crazy as Ranveer Singh) – A misal inspired white peas stuffed Bao, farsan, onion and tomato salad, served with spicy rassa. 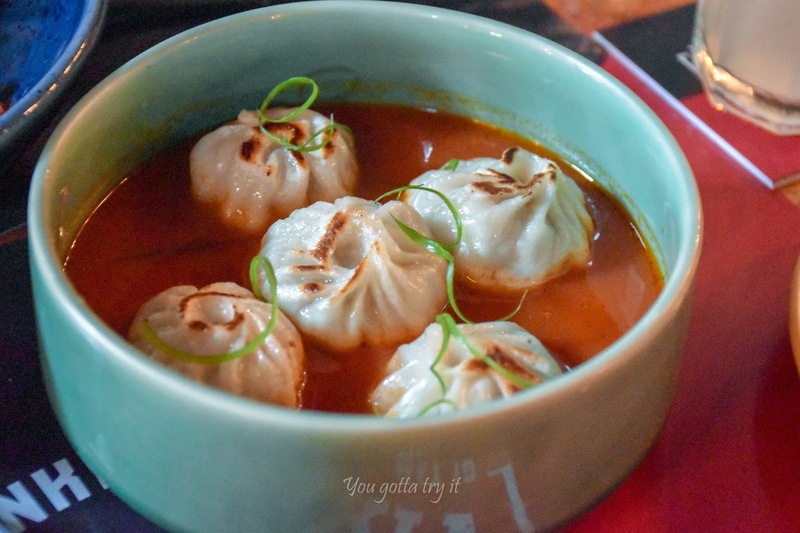 Rajasthan special ‘Laal Maas Royals’ – Spiced braised lamb dish ‘Laal Maas’ served in soft phulkas with chili pickle, Ker sangri sabji, and onion white radish slaw. 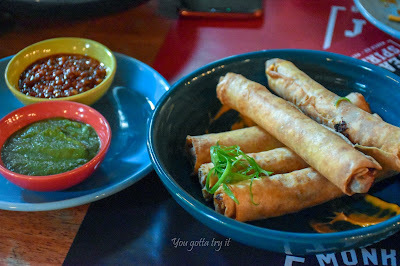 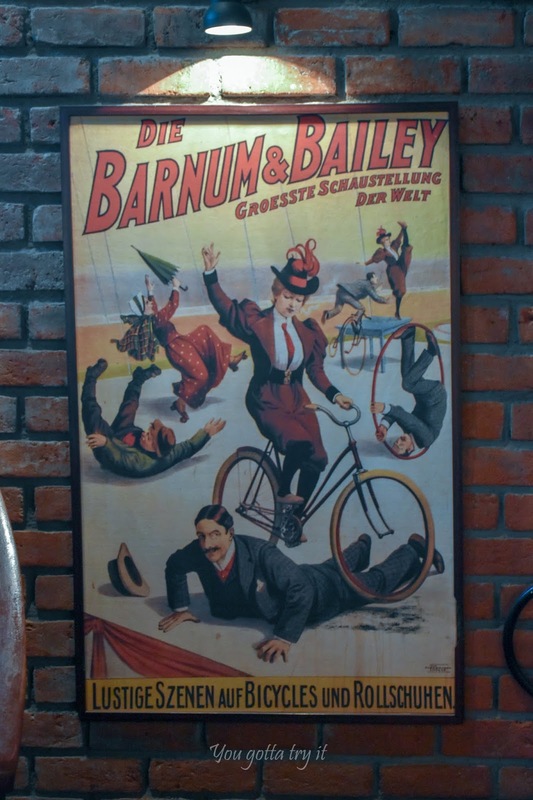 This was my favorite dish. 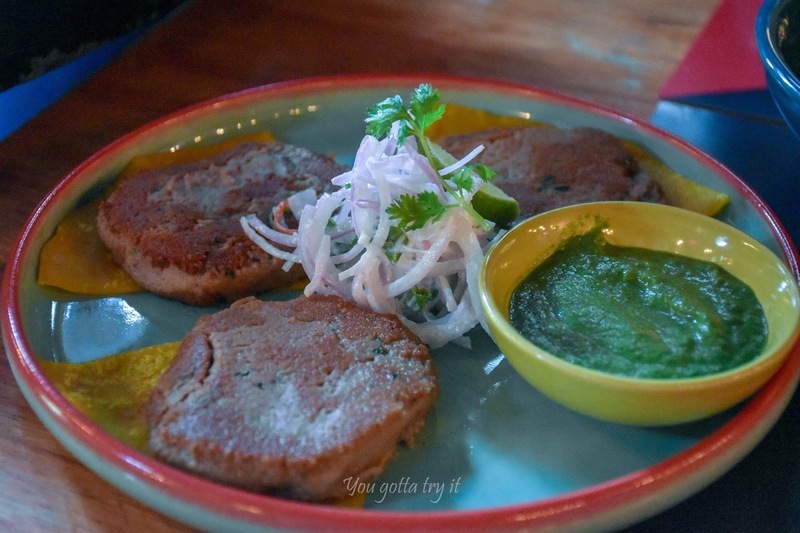 Hyderabad special ‘Chicken Googly’ – the dish which I almost got addicted. Chicken popcorn with beautiful flavors of coconut, curry leaves, and chili. Chennai inspired ‘Kothu Super King’ made of shredded Porota with egg, masala curry and spicy beef is a must try dish if you like beef. 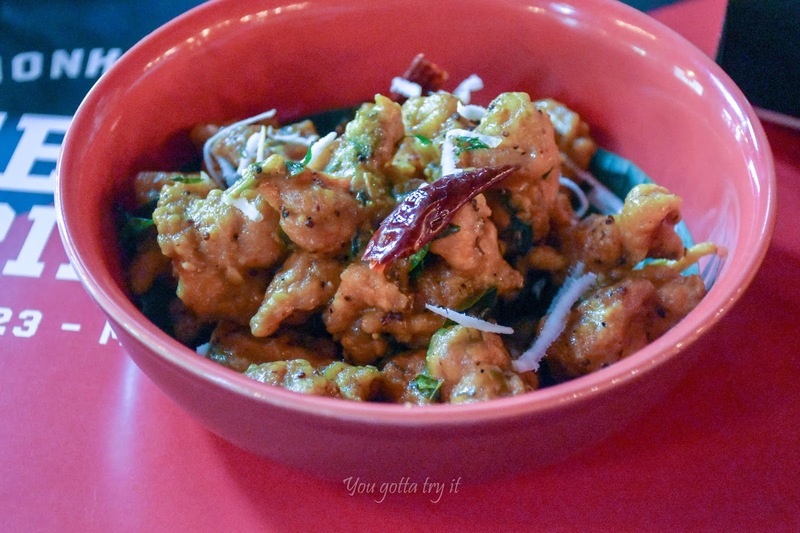 The hint of fresh coriander leaves added a unique flavor to this dish. There are few interesting vegetarian dishes in the menu and my absolute favorite was Delhi special ‘Veggie Daredevils’ which had shami kebabs made of spiced raw jackfruit and lentils. This was served with mint chutney. Trust me, this dish is made to perfection that you won’t realize that it’s a vegetarian dish. 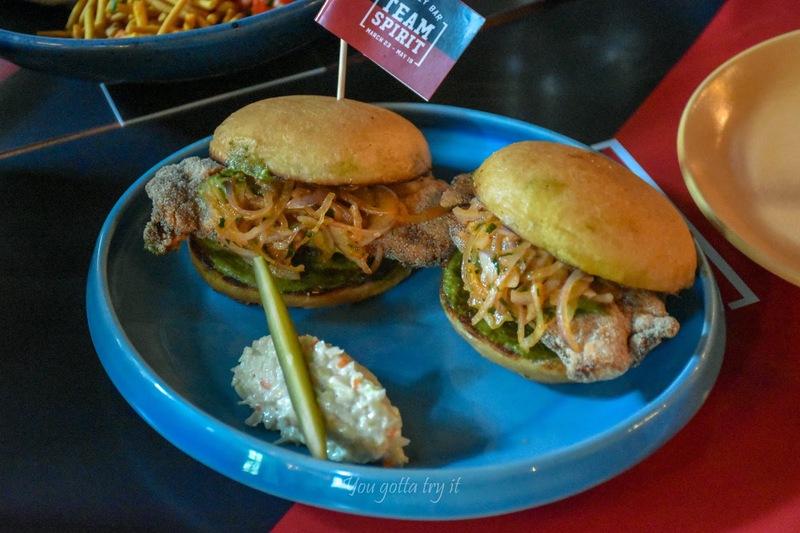 Bangalore special ‘Full Toss Fish’ – Sliders with a filling of rava coated Mackerel fillet served with a spicy onion salad and mint mayo. How can I forget my heartthrob SRK’s team? 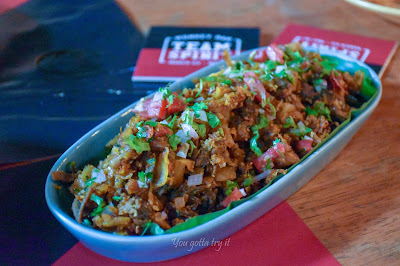 :P – They have Kolkata special Pork Powerplay which was one hit dish from the previous Kolkata Street Food festival menu. Steamed and Pan-fried pork dumplings in smoked tomato broth will surely win your heart. This is available in ‘Chicken’ version as well. 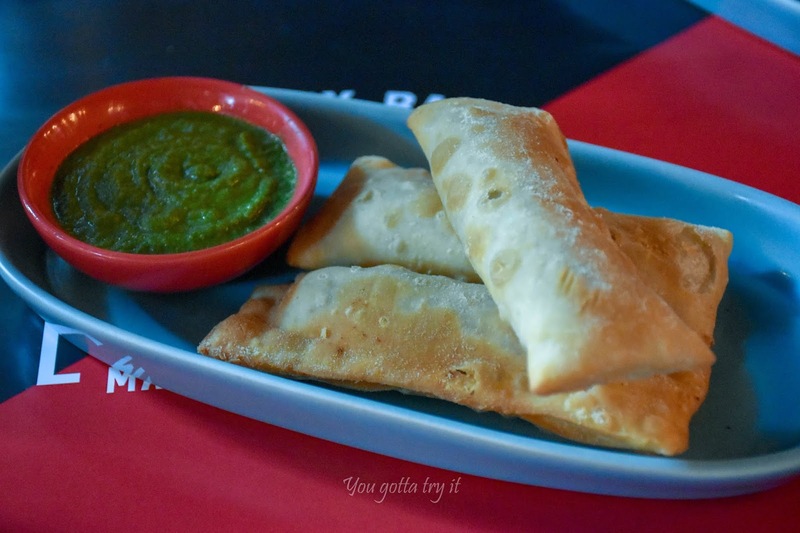 The Hyderabad inspired ‘Capt Kheema’ was so good with spiced mutton kheema stuffed flaky pastry, served with mint mayo. 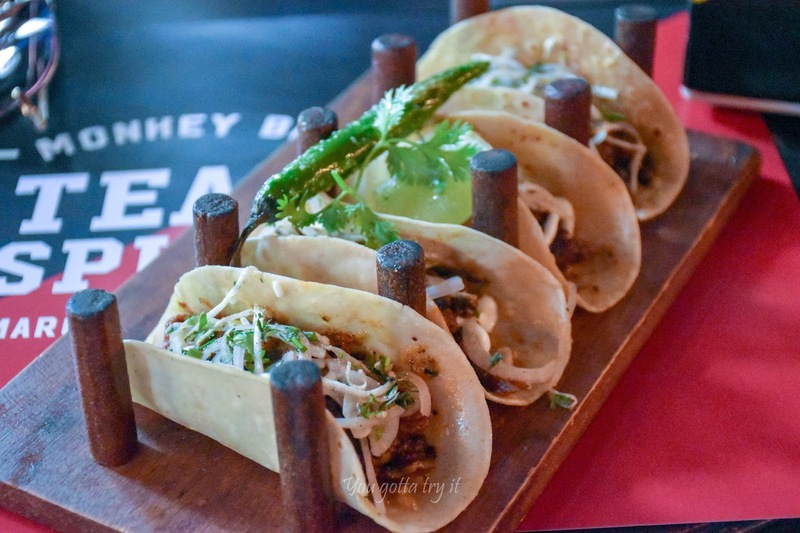 We also tried the Punjab special ‘Murgh of the Match’ - Dhaba style Chili garlic marinated char-grilled Chicken which had very desi flavors. 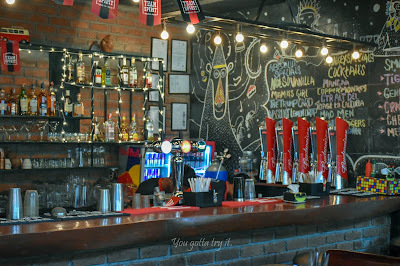 When at Monkey Bar, I always have their raw mango-vodka drink – 'Maanga'. So this time from the special menu I tried ‘Masala Soda’ which was good and refreshing, the kick of masala and lemon flavors will keep your energy high. The festival menu is available on ‘a la carte’ and small plates price starts from ₹250++ onwards and drinks price starts from ₹350++. The Team Spirit menu is available at Bangalore, Delhi, Mumbai, and Kolkata.